EDMONTON, Alberta (CNS) — It has been 20 years since Susie Laliberte Small’s sister, Marie, disappeared. Despite the pain of not knowing the fate of her sister, Laliberte Small has never lost faith that God would provide some solace. “I just depend on God, and hopefully one day we’ll have some answers,” said Laliberte Small, a member of St. Dominic Savio Catholic Parish in Edmonton. 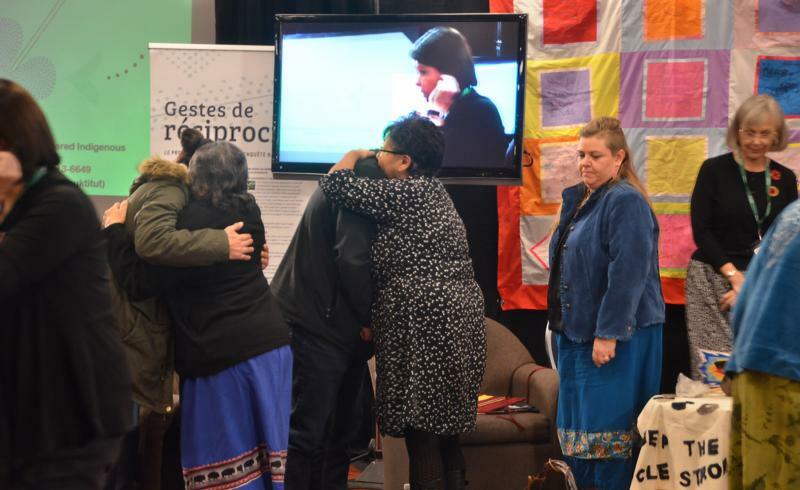 She was one of many who shared their family stories with the National Inquiry Into Missing and Murdered Indigenous Women and Girls during public hearings in Edmonton in early November. “We want closure to this, we’re tired. I pray all the time, I read the Bible, and I’ve asked, ‘Why isn’t God answering our prayer?’ But no, I’ve never questioned my faith,” said Laliberte Small. An estimated 1,000 to 4,000 women and girls have been murdered or reported missing in Canada over the last 30 to 40 years. The inquiry is expected bring recommendations to the federal government to address the systemic causes of violence against indigenous women and girls in Canada. Laliberte Small hopes that the community hearings will help families like hers gather more information, share stories and information on cold cases, and perhaps find some solace. “My hope is that some sense of closure will come to those who testify; that perhaps some cold cases will be solved; that just sharing their stories and being heard will impart a certain sense of dignity and being cared for by those who testify,” Archbishop Lavoie said. Witnesses at the inquiry say racism in police forces, the media and in Canada as a whole has contributed to the tragedy. “Why is it that when a native woman goes missing the first thing that they say is ‘Oh, she must be out partying?’ Do they say that to every non-native family that comes to the door? I don’t think so,” said Carol Bear, who testified about her mother, Mary Emily Bear. ‘”We’re here to listen so that we can gain further insight into systemic and root causes of violence against our women, girls, and two-spirit relations,” Bear said, adding it should not have taken more than 1,000 cases of missing women for the government to establish a public inquiry. Melanie Dene, whose cousin, Shelly Dene, disappeared in Edmonton in the summer of 2013, said police did not taking the disappearance seriously. “Why didn’t the Edmonton Police Service file a missing person report for Shelly right away?” Dene asked. “Because she’s indigenous? Because they labeled her as high-risk? I don’t know. That’s what me and my family live through. I don’t think anybody should have to live like that. Paul Tuccaro’s sister, Amber, 20, was last seen alive in Nisku, south of Edmonton, Aug. 18, 2010. Two years later, her body was found, but her killer has not been found. Tuccaro said he was grateful to tell his family’s story at the inquiry. “We want to help other families that are in the same boat as us. I can’t imagine how some families feel when they go to the (police) and they say, ‘Oh, we’re working on it.’ But when a non-native woman goes missing, you see it in the news and it’s plastered all over,” Tuccaro said. Carol Bear said treating everyone with respect and dignity starts with education. The inquiry will hold its next community hearings in Saskatoon, Saskatchewan, Nov. 21 to 23. It is scheduled to end in December 2018. Konguavi is a reporter for the Archdiocese of Edmonton.